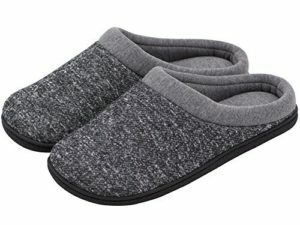 If you have been finding your slippers or house shoes too hot for the summer, you might want to try out a pair of lightweight men’s slippers. Sometimes called summers slippers, they are generally made of breathable materials and don’t have the thick lining that is used in most slippers to keep your feet warm in the winter. There are a variety of styles that are great for warmer months or for those who live in tropical climates, and we have rounded up a few of the best options. One of the most popular styles for warmer weather is the Acorn Summerweight Moc Slipper. They are a simple, yet very comfy design with a breathable cotton blend material on the upper part of the slipper and a moisture wicking terry lining that works well to keep your feet fresh. The top fabric may be a little less flexible than what you are used to in a slipper, but it will soften up after a few days of wear. Some consumers find them a little tough to get on and off quickly, but once they are on they have a nice cushion to them that helps to make them extremely comfortable. The Moc slipper is also washable, which is an excellent feature in a summer style to help get rid of odor caused when your feet sweat. You can get them in four different colors, and they have a non-slip rubber sole so you can wear them outside if you need to. The OOFOS OOahh Slide Sandal isn’t your traditional looking slipper, but a lot of men love to wear this style as a summer slipper or house shoe. The key to the popularity of this design is the extreme comfort that you will feel sliding your foot into the shoe. Men that get foot pain when walking in bare feet love this style. As you can see from the picture, they aren’t the most attractive looking slide, but if you are looking for something comfy to wear around the house that won’t overheat your feet in warm weather, this may be the style for you. They are a unisex design so you will want to be careful with sizing if you purchase this shoe. Another hugely popular summer slide that a lot of men wear as a slipper is the Nike Benassi JDI Slide. It is fresh, comfortable and relatively fashionable. They are one of the most popular of the versatile sports slides that men wear for many different activities including shower shoes and as an everyday shoe. Where this style excels is as a house summer slipper as they can let your feet breathe, are easy to get on and off, and are easy to clean. These house shoes from Vibdiv don’t look like traditional slippers, but they work great as a nice lightweight summer option. Not only do they look good, but they are also easy to get on, and they don’t leave scuff marks. 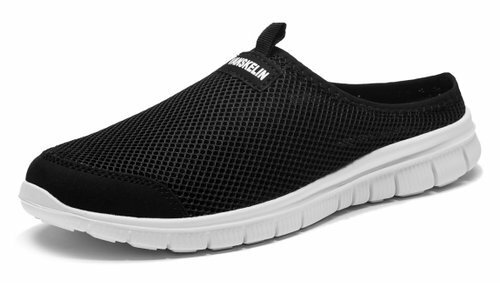 They are cool due to the upper lightweight nylon mesh that allows your feet to breath. The price of this shoe is minimal for what you are getting, most reviewers who have purchased this style find them to be an exceptional value. The sole of the shoe offers a nice cushion, although it sometimes makes a slightly odd popping sound due to a hollow circle on the design. Adidas has a few similar sandal styles that work well as an indoor/outdoor slipper. They are incredibly popular because they are comfortable, easy to get on, and are very versatile. You can wear them around the house, in the shower, running out for errands, at the beach, etc. The style pictured above is the Adissage design; it has been around for so long now that it is considered a classic. It is mainly notable for the massaging nubs on the sole of the sandal. The nubs take a little bit of getting used to, but once you have worn them for a few days, most wearers grow to love the massaging action they create. They are great for people whose feet get very warm and who want something comfortable to wear around the house. 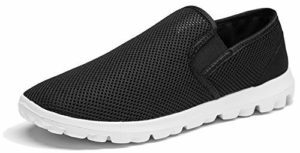 Since it has a Velcro strap, you can even wear these with socks in the winter if you love the feel of the shoe and want to wear them year round. The only problem with these sandals is that the nubs will break off as the shoe wears in, so depending on how much you wear them you may have to replace the sandals a little quicker than you would with a regular good quality flip flop. 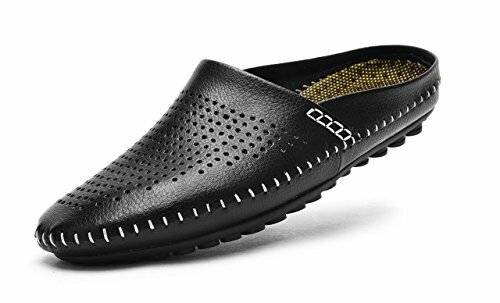 These V.J Leather House shoes are a great option if you love a leather slip-on. Sometimes leather can be a little hot in the summer, but this design has holes in the leather that allow your feet to breath and stay cool. The inside of the slipper has an antimicrobial lining to help stop odor and to absorb moisture. The soles are rubber and have good anti-slip traction which can sometimes be lacking in leather mule styles. They also work well if you want to wear them with socks in the colder months. HomeTop market these slippers as an all year slipper that will keep your feet warm in the winter and cold in spring and summer; they are a pretty thick style, but the moisture wicking French terry material helps to make them versatile for all year wear. It would make an excellent choice for those who may have issues with their feet sweating. 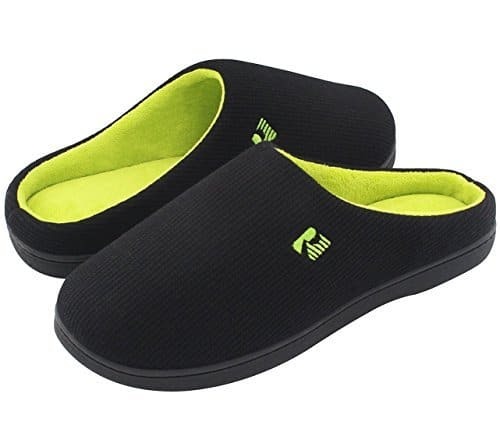 The sole of the slipper is reported to be very comfortable since it has three layers of high-density memory foam and sponge. RockDove’s Two-Tone Memory Foam Slippers are an inexpensive option that is perfect for warm weather wear. They are made of a 95% cotton upper material (cotton is known to be a comfortable, breathable fabric), with a terry cloth lining that will wick the moisture from your feet and stop them from feeling sweaty. You can machine wash them if needed, although you probably don’t want to clean them too often because it may wear down the memory foam. They may take a few days to break in, but once broken in most people find them to be very comfortable, especially for the low price. Comfort– Obviously no one is going to want to wear a style for long periods that is uncomfortable. Look for memory foam, a soft sole, sponge, and arch support (if you need it) to help find the most comfortable options. Lightweight – The weight of the slipper can also be related to how comfortable it is going to be. For a house shoe generally people want a style that they aren’t going to notice that they are wearing, this means finding something that is lightweight and isn’t clunky to wear. Sizing- Getting the right size and fit is also extremely important. Unfortunately, sizing isn’t standard across different brands so if you are buying online it is essential to read any sizing information posted by the manufacturer or check reviews to see if the product sizing is accurate. Easy to put on- Most people want a slipper that they can slip on without any trouble. The most comfortable design to get on is a mule style that doesn’t have a back. The downside to an easy to get on slipper is that they are also easy to get off, so they may fall off more than a snug slipper that has a back is works more like a shoe. Construction-Slippers generally don’t have a long life to them. Depending on the construction, inexpensive house slippers with a soft sole tend not to last more than a year or two if you are lucky. Materials-The best materials in a summer slipper is a breathable fabric. Look for cotton blends, Terry (for wicking), microfibers, or rubber if you are going for a flip flop style. Sole– These days most slippers come with a non-slip grip on the bottom of the sole. If you are planning on wearing the shoe outside ensure that you find a style that has a rubber sole so it is more durable and won’t become ruined if it is exposed to rain or other outside elements. Washable– A big advantage that summer slippers have over winter slippers is that for the most part, they are much easier to clean. Slippers for colder weather are often made of materials like suede with sheepskin linings, so cleaning them can be difficult. Almost all of the slippers on our list above can be machine or hand washed.